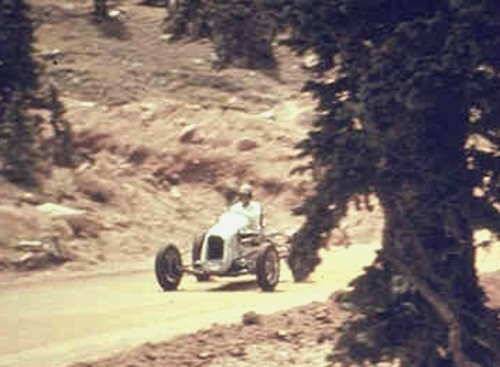 In June, 2001, photographer and website visitor Pete Garramone sent me some photos of Pike's Peak cars from the 1950's. The car below interested your webmaster because it looked like an early 1950s 4.5 liter Grand Prix car. An interesting sidebar to Ferrari racing history, little known today, was the entry of four cars in the 1952 Indianapolis 500. 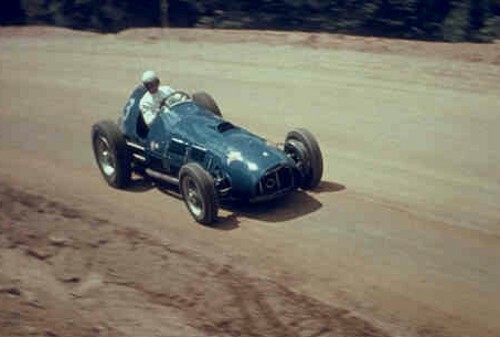 I knew that Ascari had run a Ferrari and DNF'd in 1952, but I knew little of the other cars and nothing of the subsequent history of the Indy Ferraris. Pete said he took the photo in either 1953 or 1954 and asked for help identifying the car & driver. Website visitors came through with some interesting possibilities, including a Talbot-Lago GP car (good try! ), before the historians came through with the answer to this mystery! Here's another of Pete's Pike's Peak photos. This one looks to me like an early 1950's Sprint Car. 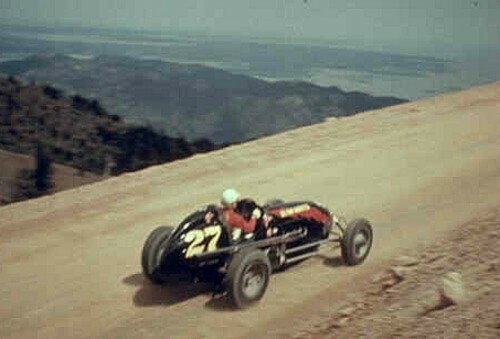 Pete's photo of another Sprint car on the Pike's Peak hill. I've never been there, but this shot gives me an idea of the incredible vistas at the higher elevations.